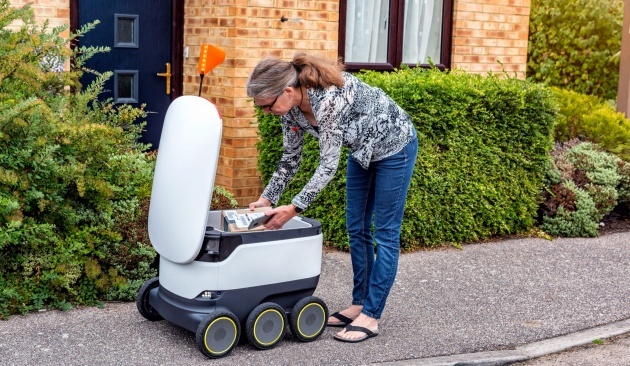 A new service has launched in Milton Keynes in the UK that allows people to order deliveries by robot. Residents can get parcels sent to a depot and receive a notification once they arrive. They can then get the items delivered to their door by robot, at a time of their choosing. A monthly £7.99 ($10) app subscription covers an unlimited number of deliveries. The service will launch in the San Francisco Bay Area by the end of the year. Once they receive the location for a delivery, the autonomous robots (they look like boxes on wheels) navigate their way to the address. They’re able to cross the road and work their way around people or animals thanks to ultrasonic sensors, nine cameras, radar, and GPS. Customers unlock the robot using a personal code they receive through the app.